Heroes of Star Wars Scape The place for all your Star Wars customs needs. The figure used for this unit is a Star Wars figure from the Force Unleashed set. Its model number and name are #18/Obi-Wan Kenobi Unleashed. Character Bio - Thirty-two years after the Battle of Naboo, Kenobi rescued Luke Skywalker from Tusken Raiders while Luke was tracking the errant R2-D2, who insisted he was the property of, and carried a message for, Obi-Wan Kenobi. They returned to Obi-Wan's home, and Kenobi used the opportunity to finally present Luke with Anakin Skywalker's lightsaber. However, when Luke asked Kenobi about his father's death, Kenobi disguised the truth from him, by telling him that his father had died in battle. Once per turn, before or after moving or attacking, you may choose a small or medium object or opponents figure within 2 clear sight spaces to Force Push. Choose up to 2 empty same level or lower spaces in a straight line from the chosen object or figure and move that object or figure onto either of the chosen spaces. Figures affected by Force Push may not be moved closer to this figure. Figures moved by Force Push never take any leaving engagement attacks but will receive any falling damage that may apply. Figures with a Force Leap or Force Push symbol may not be moved onto a molten lava space. Being a Unique non-droid or vehicle that follows the Rebel Alliance, Obi-Wan Kenobi may benefit from 2-1B's REBEL FIELD MEDIC special power. 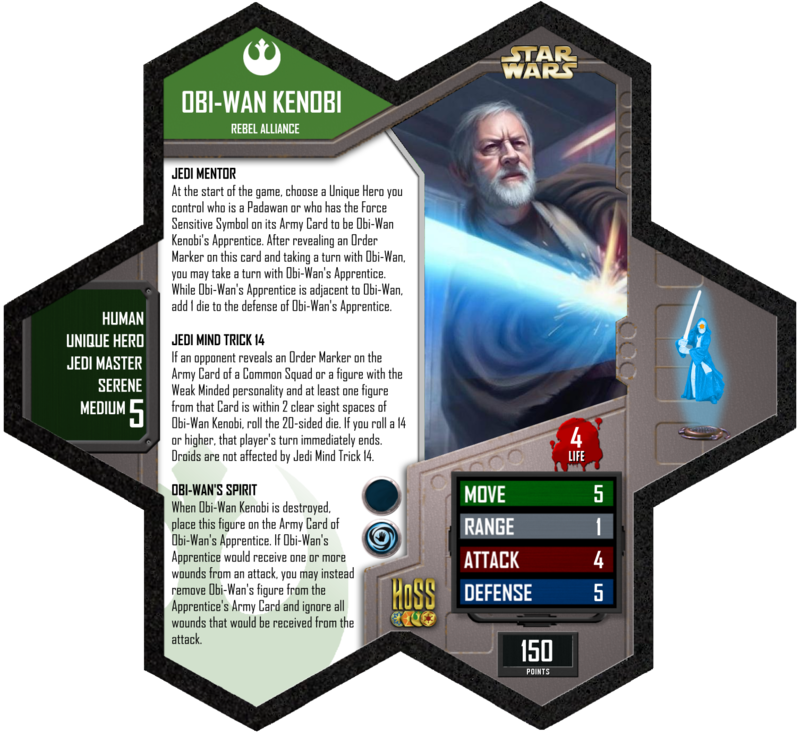 Figures with the Force Sensitive symbol on their card or Padawans are can benefit from Obi-Wan Kenobi's JEDI MENTOR and FORCE SPIRIT special powers. Current figures with the Force Sensitive symbol on their card or Padawans include: Luke Skywalker (Farmboy), Luke Skywalker (Padawan), Princess Leia Organa, Princess Leia Organa (Boushh) and Zuckuss. • B - While he is weaker than Vader, he can be a good counter to the Dark Lord and other solid heroes. He can also be an annoyance when around enemy squads and his bonding with Force Sensitives can come in handy with Luke and Leia. 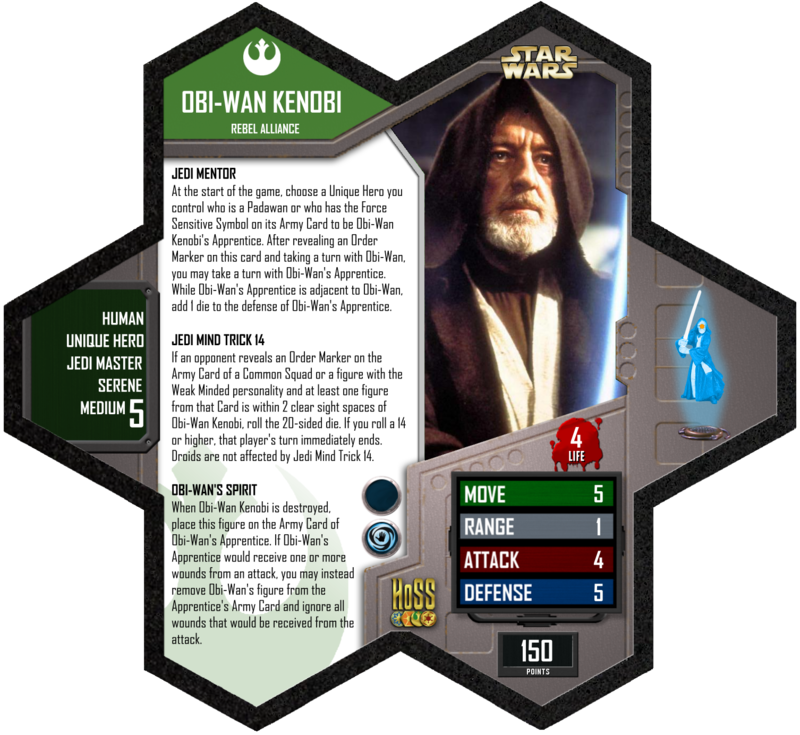 At the start of the game, choose a Unique Hero you control who is a Padawan or who has the Force Sensitive Symbol on its Army Card to be Obi-Wan Kenobi's Apprentice. After revealing an Order Marker on this card and taking a turn with Obi-Wan, you may take a turn with Obi-Wan's Apprentice. While Obi-Wan's Apprentice is adjacent to Obi-Wan, add 1 die to the defense of Obi-Wan's Apprentice. 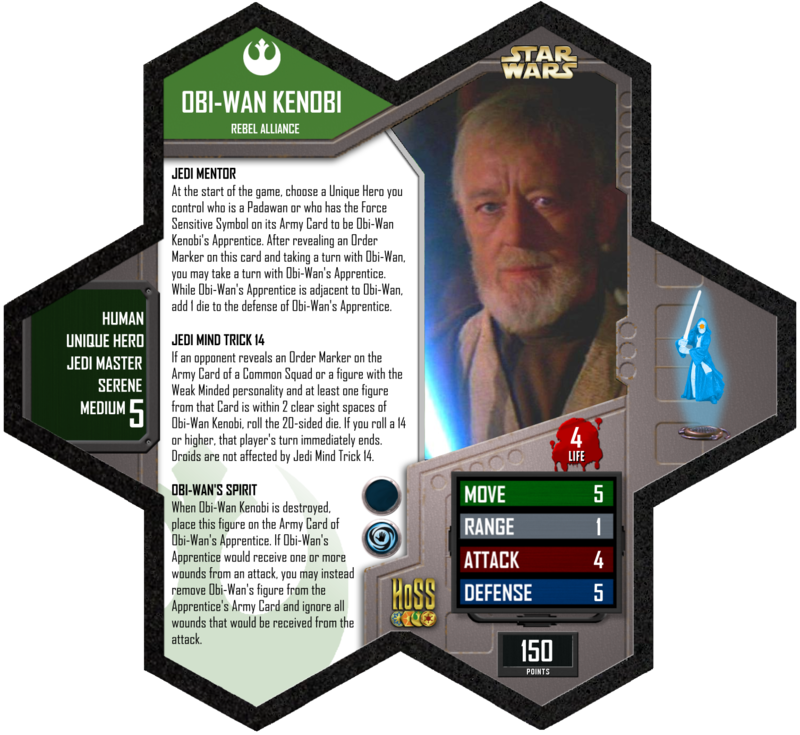 If an opponent reveals an Order Marker on the Army Card of a Common Squad or a figure with the Weak Minded personality and at least one figure from that Card is within 2 clear sight spaces of Obi-Wan Kenobi, roll the 20-sided die. If you roll a 14 or higher, that player's turn immediately ends. Droids are not affected by Jedi Mind Trick 14. When Obi-Wan Kenobi is destroyed, place this figure on the Army Card of Obi-Wan's Apprentice. 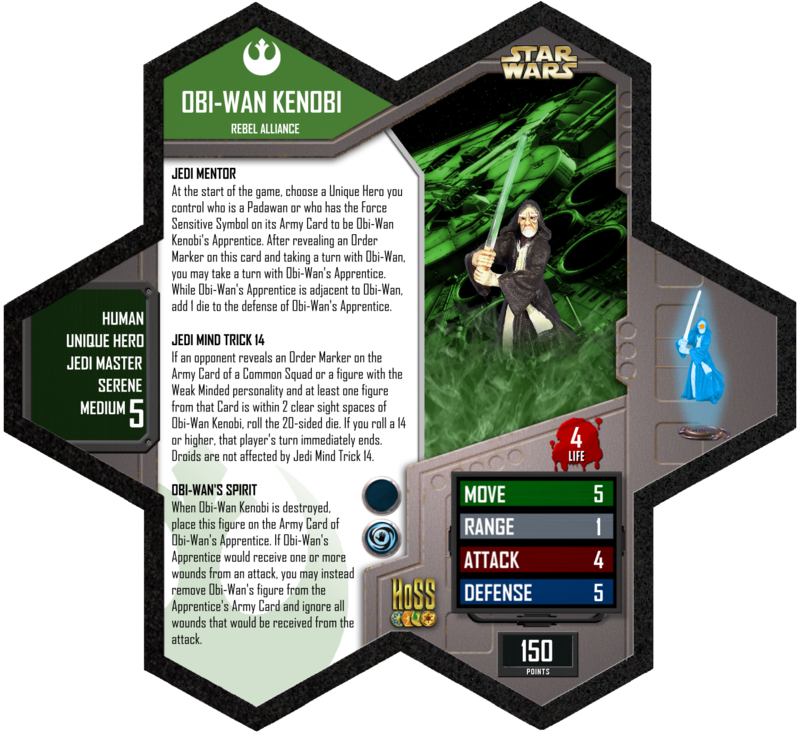 If Obi-Wan's Apprentice would receive one or more wounds from an attack, you may instead remove Obi-Wan's figure from the Apprentice's Army Card and ignore all wounds that would be received from the attack. 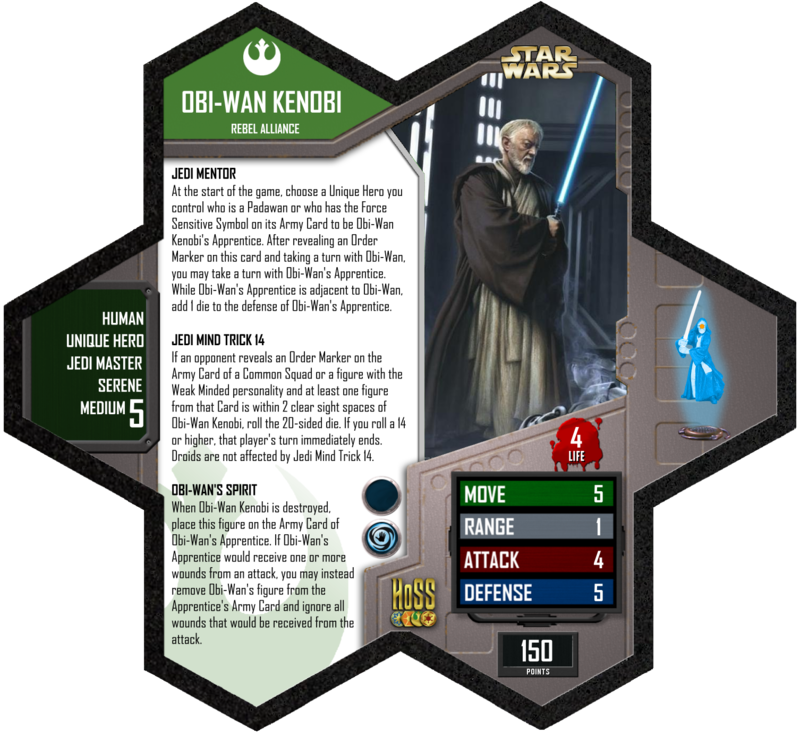 If an opponent reveals an Order Marker on the Army Card of a Common Squad or a figure with the Weak Minded Special Power and at least one figure from that Card is within 2 clear sight spaces of Obi-Wan Kenobi, roll the 20-sided die. If you roll a 14 or higher, that player's turn immediately ends. Droids are not affected by Jedi Mind Trick 14. I like this Jedi Mind Trick better than the old one. Nice design. Could you link to the Force powers in the books where that is relevant? It's easier to find when the books are a one-stop shop. Last edited by Arch-vile; November 21st, 2013 at 02:00 PM. Zuckuss is a Force Sensitive hero who can benefit from Jedi Mentor. Can't believe I missed that, thanks! There has been a minor tweak to Old Ben's cards. Revised cards have been posted to the OP along with some alternate art versions. The PDF link has been updated as well. Jedi Mind Trick 14 now references figures with a "Weak Minded personality" instead of the "Weak Minded special power". If you choose to not print a new card, just keep this minor change in mind when playing Obi-Wan Kenobi. This tweak may or may not have been necessitated by a design change in a soon-to-be-released Episode VI figure. The new card versions (including the Alternate Art Editions) have been added to the X-2 Printing App.